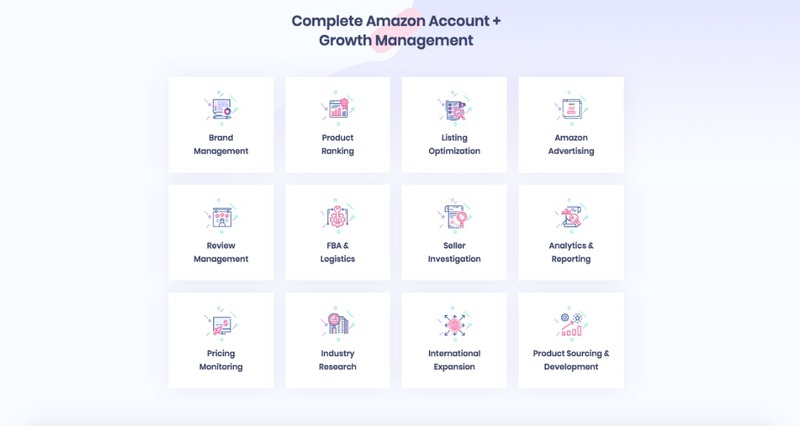 EliCommerce is the only all-in-one amazon consulting services agency dedicated to growing your brand on the world’s largest marketplace. Driving over $260,000,000 in Amazon sales, EliCommerce has garnered the experience necessary to achieve explosive eCommerce growth. This is where it all begins. EliCommerce asks the right questions to learn, identify and prioritize the gaps you need to fill to boost revenue and gain market share. 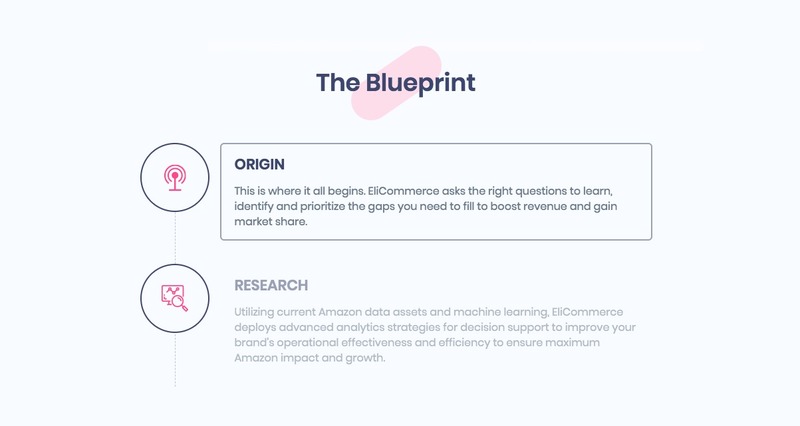 Utilizing current Amazon data assets and machine learning, EliCommerce deploys advanced analytics strategies for decision support to improve your brand’s operational effectiveness and efficiency to ensure maximum Amazon impact and growth. EliCommerce utilizes deep industry expertise to help your brand effectively rise above the competition and win in this increasingly critical channel. 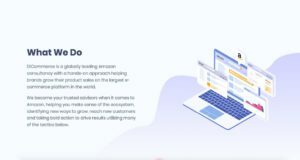 EliCommerce utilizes the unique data with an active approach to strategically outperform the competition and raise your brand above the 3 million sellers on Amazon. It’s not just Account Management. It’s Account Growth Management. 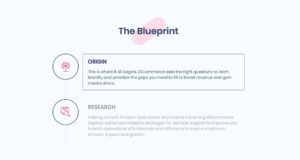 EliCommerce never stops asking the most vital question: How can we grow your brand’s sales on the world’s largest marketplace? 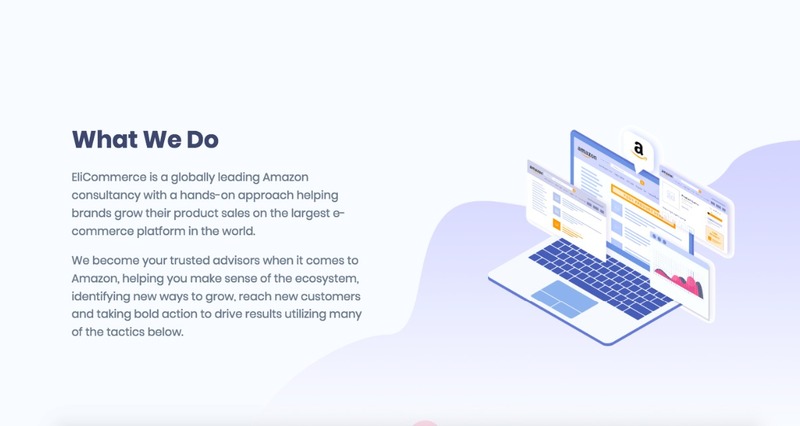 We become your trusted advisors when it comes to Amazon, helping you make sense of the ecosystem, identifying new ways to grow, reach new customers and taking bold action to drive powerful results. We are the Amazon Experts. 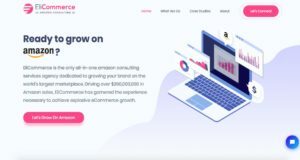 The EliCommerce mission is to achieve explosive growth for your brand by utilizing advanced operational marketing strategies and a proprietary set of eCommerce tools. 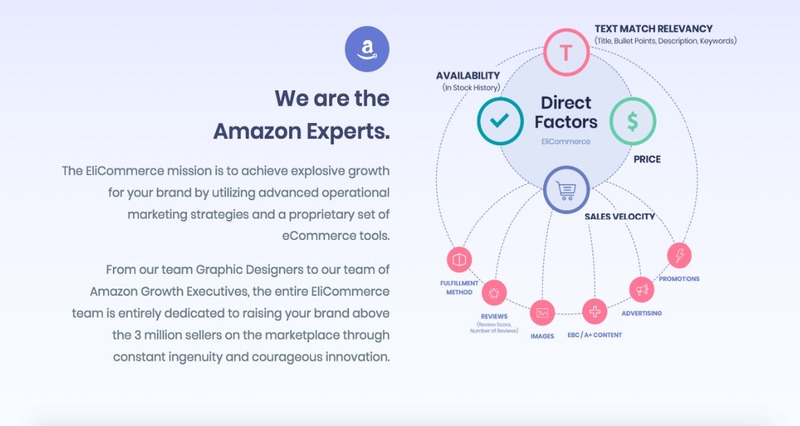 From our team Graphic Designers to our team of Amazon Growth Executives, the entire EliCommerce team is entirely dedicated to raising your brand above the 3 million sellers on the marketplace through constant ingenuity and courageous innovation. 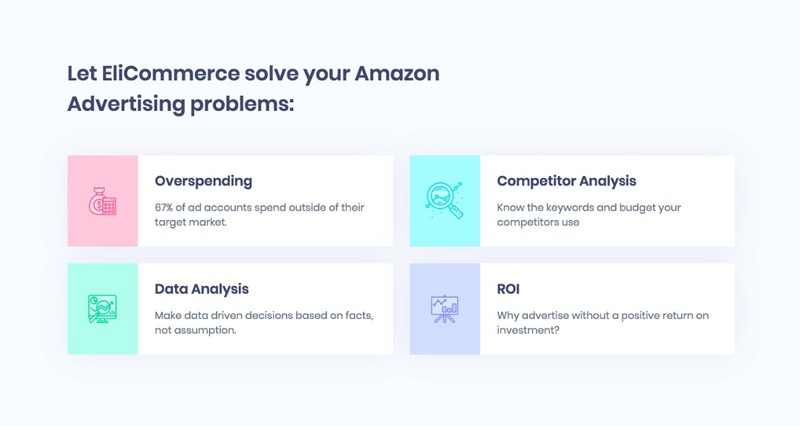 EliCommerce is a globally leading Amazon consultancy with a hands-on approach helping brands grow their product sales on the largest e-commerce platform in the world. 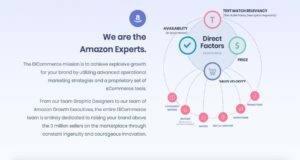 We become your trusted advisors when it comes to Amazon, helping you make sense of the ecosystem, identifying new ways to grow, reach new customers and taking bold action to drive results utilizing many of the tactics below. 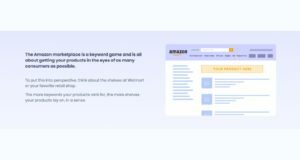 The Amazon marketplace is a keyword game and is all about getting your products in the eyes of as many consumers as possible. To put this into perspective, think about the shelves at Walmart or your favorite retail shop. The more keywords your products rank for, the more shelves your products lay on, in a sense. With SEO, there is no clear, cut-throat formula. With Amazon Product Ranking, there is. Don’t get stuck on page 9000 for your product’s keyword. 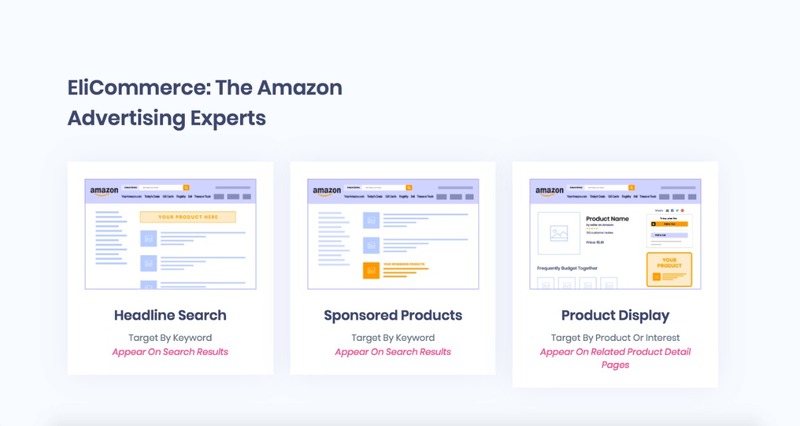 EliCommerce leverages Amazon’s A9 Search Ranking Algorithm, a proprietary set of eCommerce tools and advanced promotional strategies to organically rank your product. For every product you list on Amazon, there are more than 700 data fields to optimize. If you have hundreds of products in your salable catalog, it’s like having hundreds of micro-businesses to manage that are constantly changing. By working with EliCommerce, you’re working alongside experts to maximize your operational marketing and accelerate sales growth. 67% of ad accounts spend outside of their target market. Know the keywords and budget your competitors use. Make data driven decisions based on facts, not assumption. Why advertise without a positive return on investment? Win over potential customers with breathtaking photography, renders and listing-optimized infographics. Your images are everything when it comes to driving clicks and conversions. Let EliCommerce’s team of professional photographers, expert graphic designers and models give new life to your products. 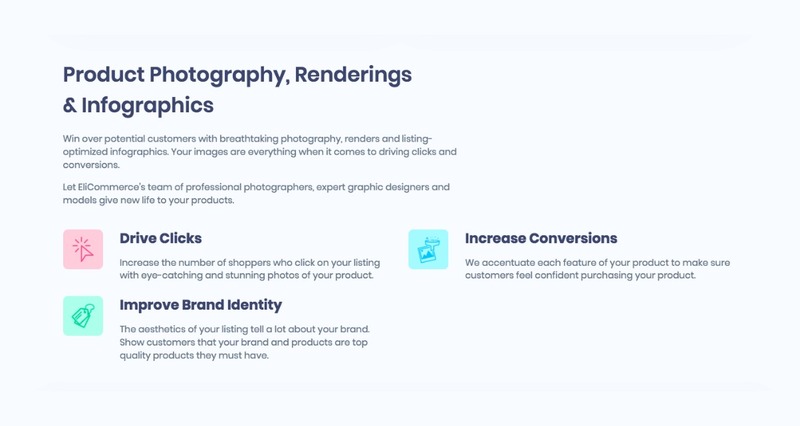 Increase the number of shoppers who click on your listing with eye-catching and stunning photos of your product. We accentuate each feature of your product to make sure customers feel confident purchasing your product. 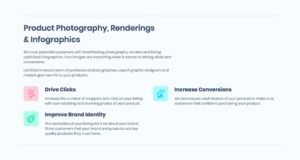 The aesthetics of your listing tell a lot about your brand. Show customers that your brand and products are top quality products they must have. Maximize keyword exposure to increase ranking and conversions. Strategic keyword placement is key to ranking. Our copywriters carefully position each keyword to optimize rankings in organic search. Our expert Amazon copywriters know how to sell products. 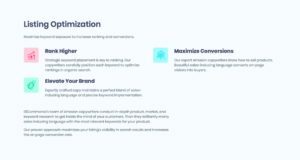 Beautiful sales-inducing language converts on-page visitors into buyers. Expertly crafted copy maintains a perfect blend of sales-inducing language and precise keyword implementation. 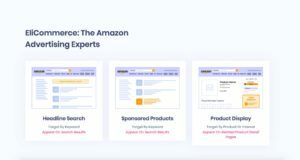 EliCommerce’s team of Amazon copywriters conduct in-depth product, market, and keyword research to get inside the mind of your customers. Then they brilliantly marry sales inducing language with the most relevant keywords for your product. 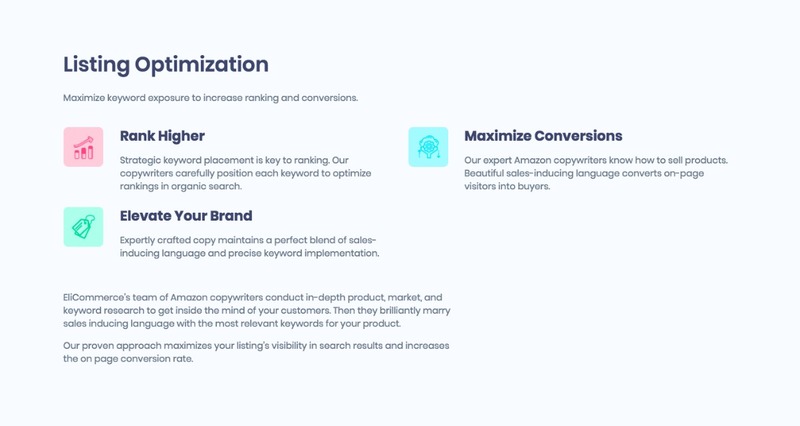 Our proven approach maximizes your listing’s visibility in search results and increases the on page conversion rate. Show up in search and convince shoppers to click. Our copywriters build powerful titles designed to maximize keyword exposure and conversion. See the most relevant, high-volume, high-opportunity terms for your product. 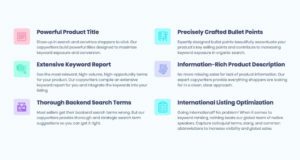 Our copywriters compile an extensive keyword report for you and integrate the keywords into your listing. Most sellers get their backend search terms wrong. But our copywriters provide thorough and strategic search term suggestions so you can get it right. 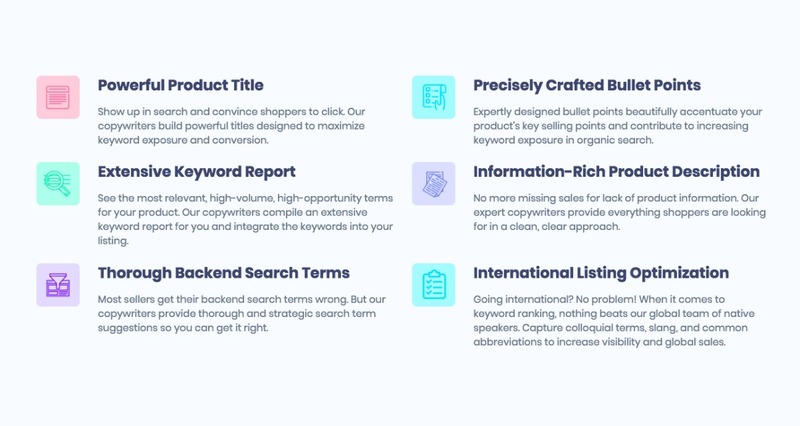 Expertly designed bullet points beautifully accentuate your product’s key selling points and contribute to increasing keyword exposure in organic search. No more missing sales for lack of product information. Our expert copywriters provide everything shoppers are looking for in a clean, clear approach. Going international? No problem! When it comes to keyword ranking, nothing beats our global team of native speakers. Capture colloquial terms, slang, and common abbreviations to increase visibility and global sales. 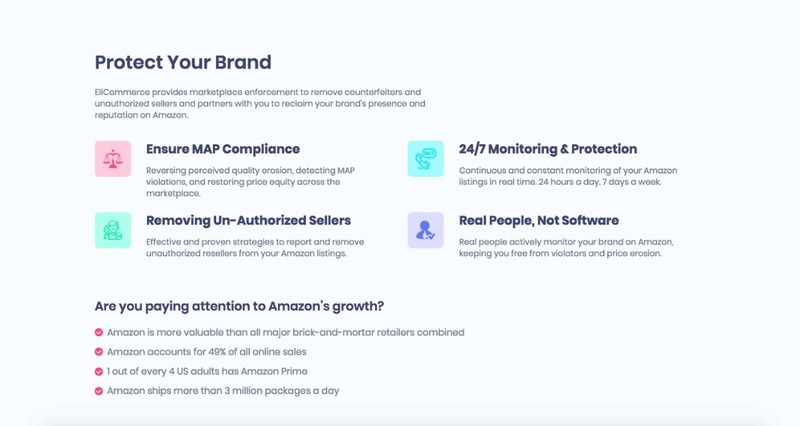 EliCommerce provides marketplace enforcement to remove counterfeiters and unauthorized sellers and partners with you to reclaim your brand’s presence and reputation on Amazon. Reversing perceived quality erosion, detecting MAP violations, and restoring price equity across the marketplace. Effective and proven strategies to report and remove unauthorized resellers from your Amazon listings. Continuous and constant monitoring of your Amazon listings in real time. 24 hours a day. 7 days a week. 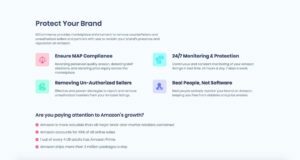 Real people actively monitor your brand on Amazon, keeping you free from violators and price erosion. Are you paying attention to Amazon’s growth? If you have a passive approach to selling on Amazon, you’re wasting your time. 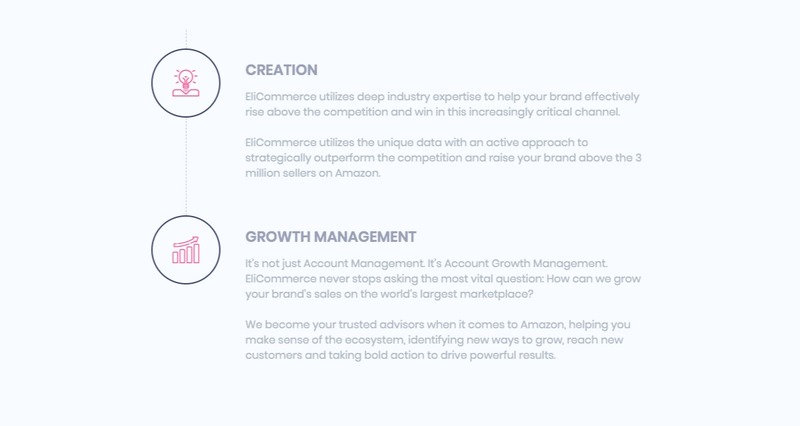 By working with EliCommerce, you’re unlocking Amazon’s true and complete potential. Jeff Bezos understands Amazon’s entire ecosystem best. EliCommerce understands selling on Amazon best. We don't have wiki content for EliCommerce – Amazon eCommerce Consulting yet. 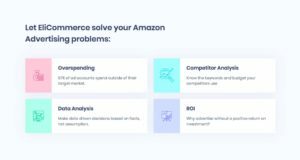 Are you familiar with EliCommerce – Amazon eCommerce Consulting? 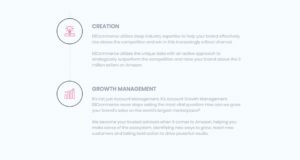 Please quickly share in your own words what EliCommerce – Amazon eCommerce Consulting is all about! 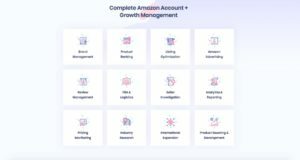 Share in your own words what EliCommerce – Amazon eCommerce Consulting is all about.